Oasis Outdoor Living & Landscapes has been turning outdoor places into dream spaces for more than a decade now. But that’s not what sets them apart from other outdoor living companies. “Anyone can come to your home and build something great in your back-yard,” says Rob Delaby, owner of Oasis Outdoor Living & Landscapes. “I show people they can trust me to create a space that will make them happy,” he says. “I know it’s a big investment, but it’s my job to show them they can spend their lives living, making memories with their families at home. It’s rewarding when I hear customers tell me they don’t even need to leave home because their backyard is like being at a resort. “We’re good stewards of your investment,” Delaby adds. With more than 20 years in landscaping and construction, Delaby along with his staff, approach every job with the objective of taking care of the customer and optimizing their space to reach its full potential, as if it were their own backyard. The Indy native, family man and father of two worked multiple landscape jobs throughout high school and college and built homes with his grandfather in Springfield, IL. After college, Delaby started his career in restaurant management, and he quickly moved to brand management for a coffee roasting company to which he remains closely connected. During that time, Delaby even took the time to supplement his food knowledge by getting a culinary degree through the Culinary Institute of America. He was also part of a team in Seattle who helped develop the Super Automatic Espresso Machine. Although the restaurant and coffee industries don’t share a lot in common with landscaping, Delaby yearned to get back into the residential construction arena after college. When the opportunity arose for Delaby to purchase a landscaping business, he dove all the way in just like with all his other ventures. Drawing upon his lessons from culinary school and the lessons his grandfather taught him when he was in the construction business, he developed his own special recipe for success. He set out to create the best team to build the best spaces possible for his customers and so there could be no better place to spend time than right in your backyard. From the beginning, Delaby established a family atmosphere with his staff and customers, never failing to show he cared about their homes and loved ones. Through the roller coaster ride of difficult economic times that started just a year after he bought the business, Delaby weathered it all by capitalizing on a critical component. From the first step when Delaby and his staff meet with a customer, Oasis Outdoor delivers on its promises. Offering unique and creative designs, Oasis Outdoor personalizes each project to the client’s space and lifestyle. Putting his whole heart and soul into each job, Delaby turned what one customer calls his virtually non-functional space into an incredible outdoor entertaining and gathering area that they’re able to use year-round. “Even when we made some minor changes to the plans, they happily complied,” The Meier family says. 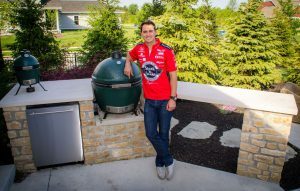 Oasis Outdoor has designed and built amazing backyards for local celebrities and business leaders like Pippa Mann, Graham Rahal, Dave Smiley, Kristi Lee and more. They all agree about the unbeatable customer service. Delaby walks the customer through the entire process and makes it a point to visit job sites in progress to personally ensure the job is being completed to his standards and the customer’s. The Huckabee family’s experience is a classic example of Oasis Outdoor’s winning, signature customer service. Delaby sets the bar high with his level of dedication and involvement with his customers. Delaby shares his caring and giving spirit with the community as well. Through a friend, he became involved in Twisted Pink, an organization dedicated to improving and extending the lives of late-stage breast cancer patients and their families by funding research. Delaby began meeting survivors and has been dedicated to the cause ever since. He also supports the Central Indiana Chapter of the Susan G. Komen Foundation and was awarded the 2015-2016 “Pink Tie Guy of the Year” award. Delaby doesn’t just write a check, he pours his heart and soul into the cause and incorporates working to help these organizations in his everyday life. But beyond building his business, Delaby loves to connect people with each other. You’ll want to transform your backyard too once you see all the amazing things Oasis Outdoor can do. 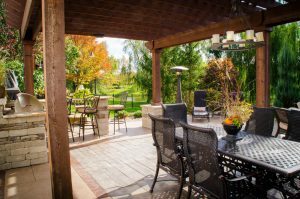 Create an outdoor kitchen with a pergola, a warm, inviting seating area with a fire pit, and so much more. Start planning your backyard Oasis today. 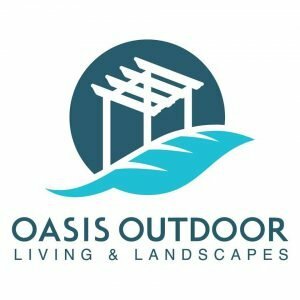 Visit myoasisoutdoor.com to browse the projects in the Oasis Outdoor portfolio. If you already have ideas in mind, give them a call today at 317-485-6514 for a free estimate.